The very gorgeous Sana Khan is always on a style spree when it comes to her fashion sense! This very talented Femina Miss Beautiful Smile 212 Diva is a style expert herself. Here are few of her looks styled by Bienmode which she carried with much grace. With over thousands of fans, this girl never disappoints her fans with her looks! So let’s have a look at few of her best looks styled by Bienmode which definitely made her the star of the event! A look you definitely can’t get over! Sana Khan carried this beautiful white gown by Kamaali Couture just like a PRINCESS. With touch of gold, this colour made her look like a fierce goddess signifying the bold heart within her. She is giving us some royal goals with this dress and the complimenting accessories also added to the look well. Get your princess style look too with Bienmode! 2.Killing It Like A Queen! The bold beauty is totally killing this bold yet beautiful look done by Bienmode. Styled in an Elisha Wadhwani Official gown, Sana Khan is already giving us some amazing ramp goals! This timeless beauty is looking freaking gorgeous in this beautiful pastel shade net gown having a bold touch of golden. Also, jewels by MK jewels are complimenting her look well! Carrying the look in her own style is giving us some Sana Khan beauty definition goals! Wrapped u in this pretty pink kimono style outfit with beautiful roses over it, she is all set to turn some heads up in the hall. Styled by Bienmode in a Ge Isha Designs outfit, she rocked the magazine shoot in Gurgaon. Indulged in the citylights of the beautiful city of Ggurgaon, her dress added a bit more to the lighting of the city with her starry look! Making her way into the traditional styling, Sana khan slayed even the traditional look with grace. 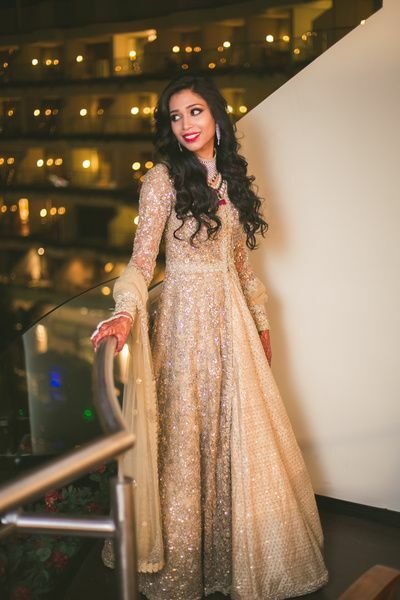 Keeping it festive in this beautiful golden brown anarkali outfit, she looked absolutely breathtaking for Eid. An outfit by ‘Kisneel by Pam’, styled by Bienmode made her look a heart warming treat for the fashion lovers for the festive go. The beautiful earrings by Purab Paschim just made her look complete! Sana Khan is always a step ahead when making her way in bold. She slayed this bold golden yellow gown with her charisma in her own unique style. All dressed up for the party in metallics, she put this breathtaking bold look trend in a whole new dimension in this gown by Geisha Designs styled by Bienmode. Giving us some bold beauty goals by keeping her look on fleek, Sana Khan set the stage on fire with her killing looks. Styled in this beautiful black dress with stone embellished neckline, she made a strong way into the Delhi’s women empowerment event. 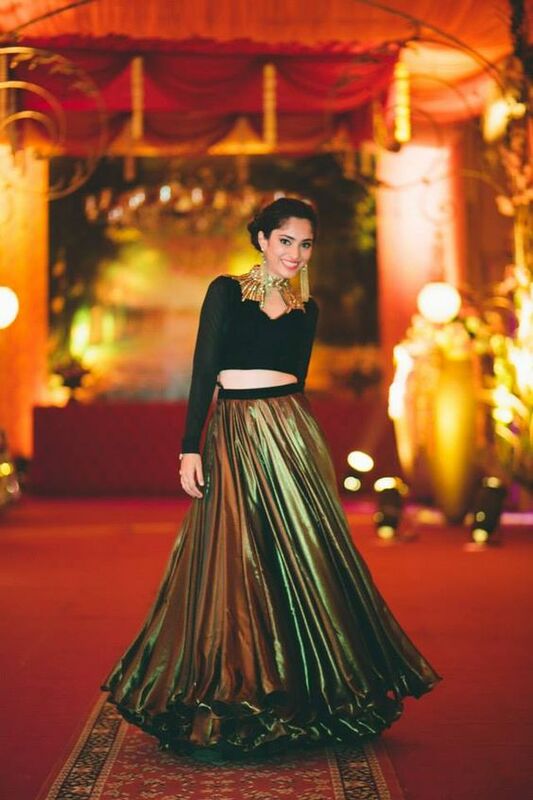 Wearing the outfit by Junne Couture and Sawan Gandhi, she proved her looks styled by Bienmode! When it comes to fashion trends for men all our choices revolve around T shirts n trousers and jeans all that stuff! 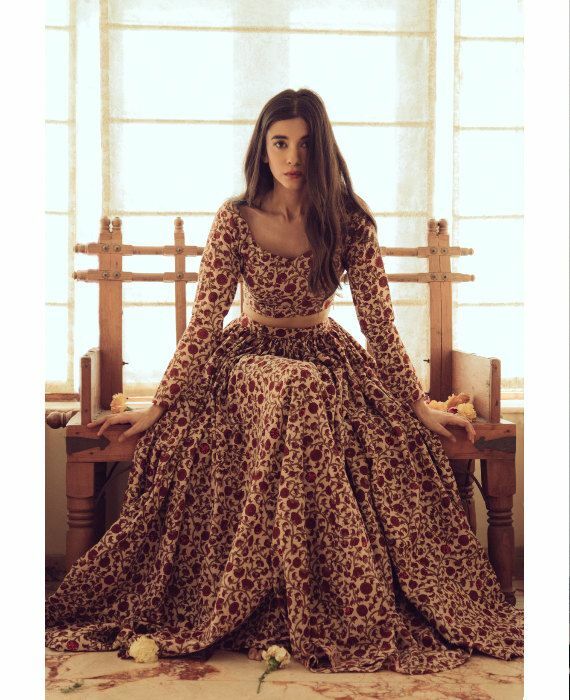 A kurta? Nah! It’s never an option. But cheers to our stylish who have created cool yet classy looks with the hot trending asymmetrical kurtas for men. Experience the other than traditional side of kurtas with a tint of hippy look with the ASYMMETRICAL KURTAS! 1.Go for the trouser style! Experiment a new formal and cool kind of look with a light colour asymmetrical kurta paired with a pair of trousers. Pair a perfect pair of aviators with this look and get ready to make some heads turn at you! Pastels are not just for women! Men too can rock the look in cool pastels. Team a loose trouser or khaki pants with light coloured pastel pink asymmetrical kurta. Add a pair of sober brown sandals and make you the best looking man in the room! Style your long asymmetrical kurta with distressed denim and add a pair of cool sneakers to this look and get the perfect street style fashionable look done in few minutes! 4.ASYMMETRICAL is the new black! Combine the two of the hottest trends in the world and be the game changer with your style statement! Take cues from this look incorporating a black asymmetrical kurta styled with loose printed pants to get a little street style punk. Brown sandals would still suit the look and make it even more interesting! With the festive season hit of the year, the time has come when women don’t compromise with their looks. With dressing, it is equally important to flaunt the beautiful ensembles and jewellery pieces as well to reflect their festive style! This year, the trend for the jewellery is to include minimalism styling with beautiful designs to be worn with vibrant colours. To avoid over doing, it is important to balance the style accessories in a simple way. It’s time when women are moving beyond the conventional jewellery styling and are getting indulged in fresh and new styles. Everybody is looking for something simple and ethnic that weighs less. So the best option is to adopt new contemporary styles! Lightweight, colour stones embellished finished pieces are the best for the elegant look. The round bold stones studded necklaces with same stone inspired drop earrings are the trendy GO for this season! If you love to lay it simple yet fun then go glamorize your outfit with multiple big rings to compliment your unique style. Create patterns, mix and match different sizes in the same stone to get the bold and different look. The multiple ring trend is elegantly edgy and festive at the same time as it gives a rich feel. Pair a piece of same stone studded bold neckpiece to complete the look! It is the season for style like ruffles, floral, flowy, and flared bell sleeves outfit. So, why not let your jewellery also experiment a little bit? Get your jewellery in tassel style and slay the chic look for Diwali! A tassel Neckpiece to express the style in beaded stone work, flowy tassels with pick of colours of your own choice could go with any easy outfit. Make this look your Diwali look and make some heads turn in the room!! 5 Best Diwali Looks In Budget for 2017! The time of the year has arrived when all women go mad about thinking what to wear, how to dress during the whole festive season! Are you also going all crazy looking for the best Diwali outfit for this year? Since everyone, all the cheeky girls, the gorgeous beauties, the newlyweds and even the family women wants to look their best at Diwali, we got few looks sorted for this big occasion. All you need to do is, give this blog a good read and you are good to go to look a goddess this Diwali!!! Wrap up in WRAP style! Go for this beautiful wrap style green moss flared top with flowy cuffs! Air it with a beautifully embroidered Lehenga or a mirror work pastel shade lehenga to get the sheer yet bold look. This beautiful piece can also be aired with light ink skirt or net lehenga to get a pinch of heaviness and detail. The gorgeous green moss top by Siddartha Bansal! Be the trendsetter or the fashionista of your circle by experiencing new trends and styles! Pair this beautiful bottle green frill top with a silk lehenga or a wine colour pleated long skirt. Create the best fusion look in budget with this beautiful designer piece by Siddhartha Bansal! Go for the cold shoulder boho style! Break the trend with Palazzos! If you are a fan of printed graphic palazzos and loose style then here is a perfect pick for you guys! A simple yet refreshing look, to symbolize the beauty within you! A maroon sleeveless Kurta with printed palazzo could be the great get way with outfit this Diwali! For the best look, air matching earrings and footwear and dazzle your Diwali look! Get this look at Ajio.in! If you want to experiment the bright side of white, then go for this amazing design laying the shades of grey and white. A beautiful net grey floral lehenga with the detailed back white choli is a perfect option for the fuller look for Diwali 2017! The silver and golden thread work on the lehenga is a catch for the lehenga. So air this outfit with the matching accessories and get this breezy and bold look at dil_dil_gal_couture, designer at Instagram! 5 Best Fusion Outfits for this Festive Season!! This festive season is just approaching and we bet you are all confused planning your outfits already. But don’t worry; Bienmode is here to save you from this big issue of styling! This time, just master one big trend of this year-Indo western fusion. We have created few desi mix and match outfits to match your desi level and rock this festive season in style! Add a jacket to your regular lehenga choli and create a funky fusion. This can be done with any kind of lehenga choli or you could pair your regular lehenga with a crop top and short jacket. Other ways, you can also go for a plain lehenga with long embroidered jacket with open front or sequin work. 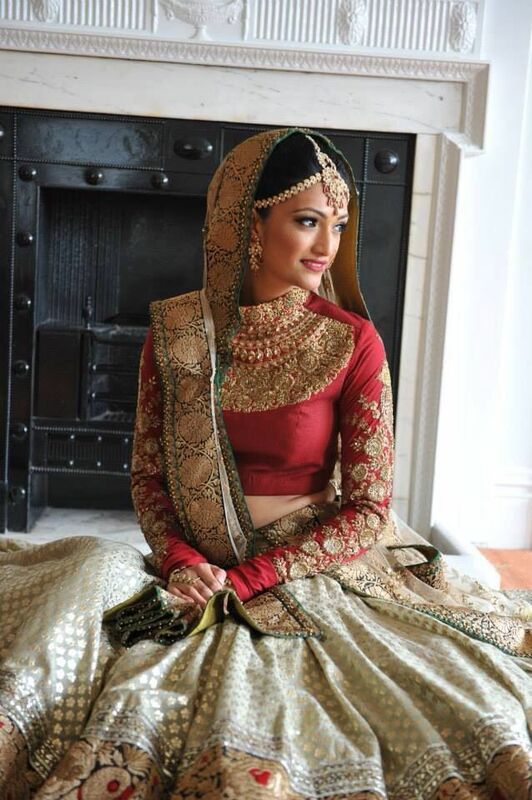 Just get dolled up by adding a jacket to any regular lehenga you have planned to wear!! Slit is the hot trend for this season. So including this look in the festive outfit would be like the cherry on the top! Slay the fusion look and match an off shoulder or tube front slit kurti with dhoti ants. You can also go for the bold shades like hot pink and blue and air them with simple black tulip ants. This look for sure make you stand out in the rest of the crowd, defining your style! If you want to stand out bold then you should go for a one shoulder cape blouse! It’s your way how you air it, air it with a cool dhoti pant or a plain long skirt or you can even go for less flared palazzo pants. Choose a vibrant coloured cape with mirror work or thread work to give it a bold look. To complete the look, you can do this outfit by adding a pair of long earrings and high heels and you are all set to rock the girly yet trendy look! The peplum trend is not just for one piece or beautiful party dresses but also for the traditional trend! You can make peplum style your outfit idea by giving it a whole new dimension. Pair a matching coloured peplum with the drape saree and a sleek belt to hold the look. You can also go for a heavy work peplum top with simple dhoti pants or patiala with metallic jhumkis to give the look more festive effect! If you want to try something different and unique, try the boho look. Incorporate the boho theme into your festive styling routine. Get yourself a funky boho jumpsuit and pair up all the good and beautiful accessories with it to add the desired traditional touch. Pair a beautiful set of earrings, bangles, neckpiece and perfect footwear to give it the complete heavy look. Since boho and traditional are special at their own places, they can never go wrong together. So create this funky boho look and be the stylish role model of your family! Since they have the tendency to start things with much vigour, red is ‘just’ the colour for you. Go red for your styling. Adding the splash of that perfect shade of red would do the magic needed! For the earthly sign, the style that you need to follow has to be CLASSIC! Go for the light colours and the classic black. To the most shiny ones shimmer would just be perfect! Go for sequin clothing with bold colours and be the odd one in the crowd. Ruled by mystery, your style should definitely be unique! Luxuriate with soothing colours and include GREENS in your routine. The bosses are here! Get ready with perfect shades of brown and black and if you love colouring then go colour your head and get some amazing highlights! The rich ones! Increase your potential with your style statement. Include smokey eyes and bold dresses in your routine and yes don’t forget to keep those eyebrows on fleek too!! The all time balanced people can go with anything by their side. Be it something classic or even something really vibrant. Balance your style with shimmer and whites. Nothing quite peculiar for the fierce people but going for bold lashes and messy hair could keep your style on point! For the freedom lovers nothing can be specific , so go with the flow! Go for long maxi dresses with strappy sandals and minimum makeup to get the fresh look. The one with their life in ‘order’ knows everything well! So here’s a tip to experiment with your style and including cutting-edge fashion , strong necklines and bold makeup. Exclusively eccentric, these people revolve around mystical style. Go shopping and get bundles of blues for your closet and makeup stash as BLUE is the colour for you! The rosy and cozy people, go for pastel colours and perfect shades of pink for you. Go organic and natural with your makeup too and you are just good to go! 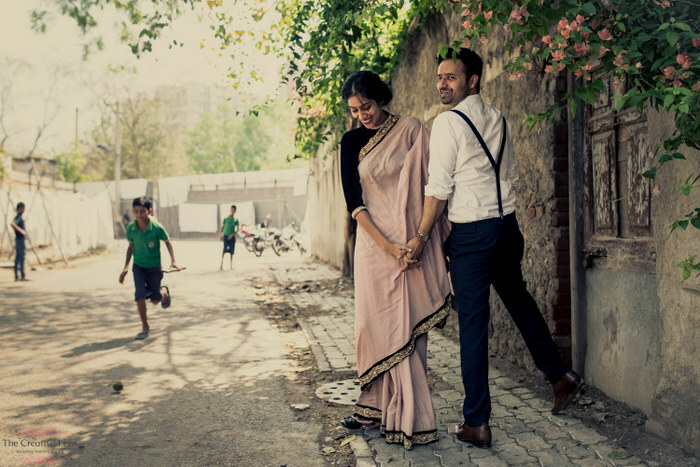 Whether trying scenic locations, beautiful views or a place full of hustle bustle, pre wedding shoots ought to be the perfect as these memories are gonna stay forever with you. As it happens only once in a lifetime you really need to put all the efforts to make it special. But the question is what to wear at these dreamy shoots. 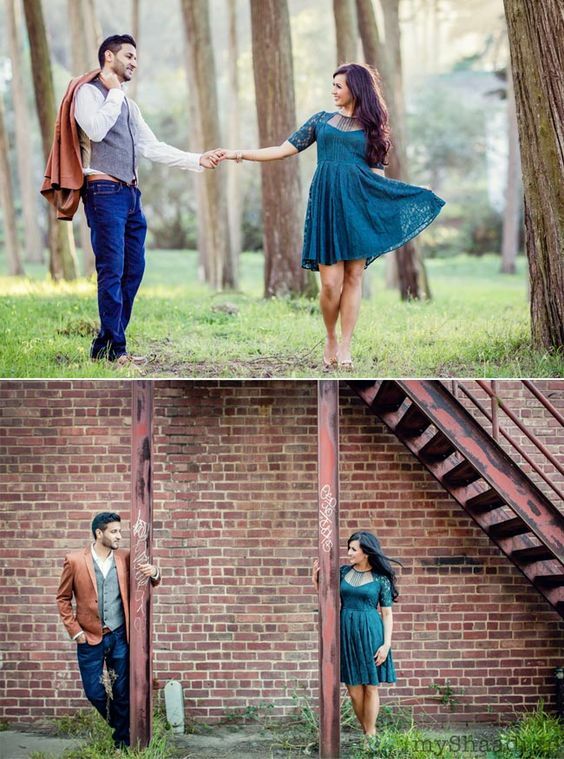 Here’s a list of options for the brides to wear at their pre wedding shoots! A summer dress to flaunt! If it is summer time then go for a cute summer dress. It is an evergreen option available in various prints and colours. To get that perfect look for the shoot go for vibrant colours and floral prints! A maxi dress can never go wrong for such important occasions. If it is a destination shoot or even amidst the nature kind of photography, a maxi dress is a good to go option to carry little bit of that wedding look. A bold and solid colour or a V neckline dress is the best option to look way more gorgeous than you thought of! Wedding and saree? Always a thumb up!! If it’s raining outside or the weather is kind of cool and green then the best option is a saree. A saree in warm pastel colour will look great and even compliment the weather and the colours in sky. So this time grab a saree before your shoot ASAP! If you are looking for a vintage look at particular destinations or old locations, then a beautiful evening gown is the prettiest thing you can wear. After all it’s your wedding so why not make it royal! A fun and colourful Patiala Punjabi suit is the best option when you want to look traditional and cool at the same time. Perfect pick for a bride to be look! Check out our article on Beautiful-bridesmaids-looks. It’s your Bff’s wedding and you want to be that superstar kind of bridesmaid looking gorgeous at all the functions. It’s your forever mate’s *BIG DAY* and the day to execute all your ‘at my best friend’s wedding’ plans, so here are few looks that we have created so that you can rock your looks at the wedding and still keep the enjoyment by your side. This time go different with palazzos, dhotis and a lot more!! Go for a contemporary dress! Since it’s a wedding function, you need to keep that little touch of royalty in it. So go for a long maxi dress or a heavy floor length gown with embellished necklines and a perfect hairstyle that suits you. For the mehendi function, go for soothing light colours like yellows and greens. Since you need something beautiful but comfortable too for this day function, go for high low kurta paired with palazzo pants or the trending hot dhoti pants! For a cocktail night or the Sangeet ceremony, keep it dazzling in bollywood style with mirror work anarkali or an evening gown and you can even go for a colourful crop top and lehenga. Remember that your dress includes mirror and starry kind of work for this wonderful evening! We all see wedding outfit ideas posts every now and then but when it comes to those small yet important functions during the wedding we don’t know what to wear! Here are some super stunning mehandi outfit ideas that will make you look great and comfortable at the same time. With the fusions of modern and traditional, here are the few best ones because it’s much more than Lehengas at the wedding! 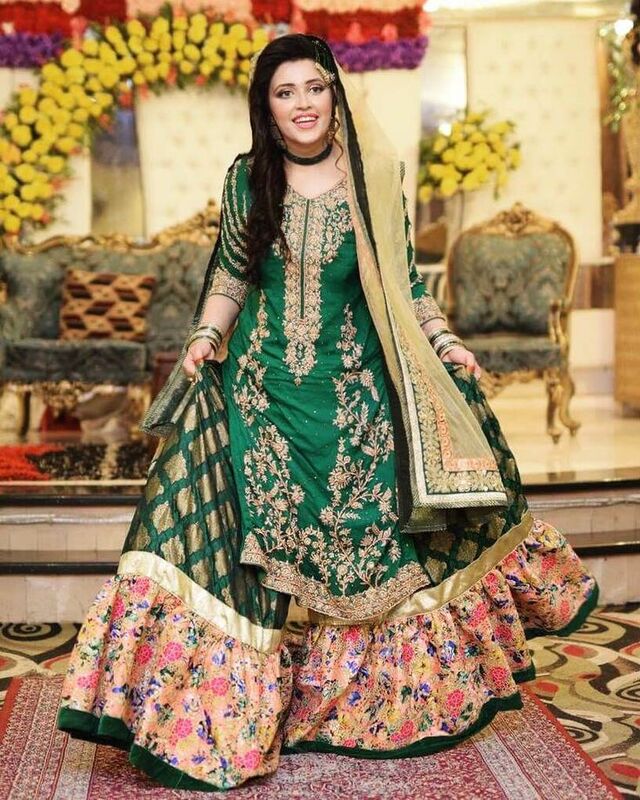 If you want to try different styles of outfits for every function then this style is the best option for a mehandi ceremony. A plain dhoti with cute off shoulder top or cape top would definitely make some dressing goals! Florals are the evergreen kind of style and for mehandi ceremony this could be the best outfit. Choose a beautiful printed floral skirt and team it up with designer blouse and your super comfortable mehandi look is all set! If red and oranges are not what you want to wear then you must go for a gorgeous green lehenga. A green lehenga with beautiful border and some accessories will for sure set you apart from the crowd! Incorporate the two very interesting wedding outfit ideas in one single outfit and hit the floor all diva style. Super comfortable and totally chic, a dhoti saree is fab option for this short ceremony. To make this look more bridal, choose the perfect shades of red and pink and you are good to go! 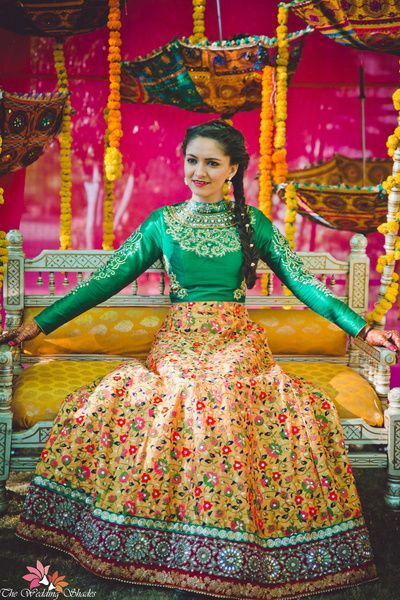 The evergreen love for Lehenga! If you want to be the bride with lehenga then it’s perfectly comfortable for you to choose a plain lehenga with delicate work. Choose the colours like mint green or coral pink and be ready to look the OMG- gorgeous!! Check out our next blog post: TIPS TO MAKE IT FEEL LIGHT IN YOUR WEDDING DRESS! Tips to make it feel light in your wedding dress! Don’t lose that bridal smile of your face worrying about your LEHENGA! It’s tough to handle those heavy work lehengas with all that nervousness, bundle of mixed feelings, pressure of to be bride and still manage to have that perfect glow of your cheeks done right! Here are few tips that will help you reduce a little weight of your wedding dress and still feel bridal. The most important element in wedding dress is the selection of fabric. While choosing the fabric keep in mind that it is not too heavy. Choose the fabric with heavy work but LIGHT fabric. Say hello to the PRINTS! This time don’t keep it too conventional. Since it’s your big day why not try something different! Say bye-bye to those heavy embroideries and mirror work lehengas and welcome the trend of new printed and patterned skirts. To add bridal touch to them just add the work of Gota Pattis in them! Go smart with single dupatta! One from the waist, one from the top..oh it’s all a mess! Act smart and choose one single heavy and beautiful dupatta that too on your forehead and secure it with beautiful Mang Tikas or Head Patti. Make you look pretty and sober AND feel light at the same time. Go for the designer blouse! Add little twists and turns to the wedding styling by choosing heavy and designer blouses instead of a heavy lehengas. Go for the most stylish and beautiful patterns and designs for blouses and slay your wedding look DIVA style! These are few tips that will help you to select your lehengas more smartly by making you feel a little light on your wedding. Act smart and be the simple yet stunning bride!! Related post: STUNNING MEHANDI OUTFITS!! !